Comfort and utility come together in the sandstone Detroit jacket. Sturdily built of 12 ounce, 100% cotton sandstone duck, it features blanket lining in the body and quilted-nylon lining in the sleeves. There’s an inside welt pocket, two lower-front pockets, and a left chest pocket with zipper. The waist and cuffs are snap adjustable. 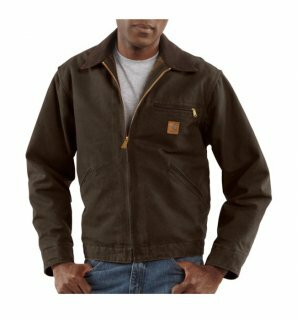 The jacket also features triple-stitched main seams and a bi-swing back for easier movement.